Henry Roman Nose 1856~1917 Cheyenne chief Henry Roman Nose for whom this State Park was named originally owned this 600 acre tract which comprised his allotment. His campground was located about 50 yards north of here. 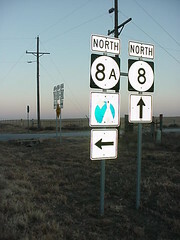 His grave is one-half mile west of Watonga. 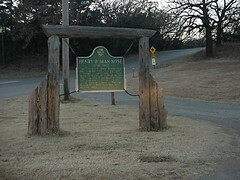 Roman Nose State park was opened Mary 16, 1937. 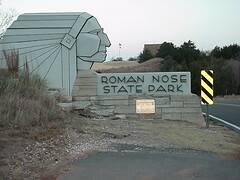 Roman Nose State Park is located on OK 8 and OK 8A seven miles north of Watonga, 81 Miles northwest of Oklahoma City, near Lake Watonga and Boecher. Historical Marker is located inside the park on the road marked Canton,OK. Note: I looked for the grave site, but I had to call my search off because of darkness. Sometime in the future I may try to locate and take a pictures. Roman Nose State Park was once a favorite area of the Cheyenne tribe.the area is a scenic retreat in canyon bluff that overlooks ancient mesas. Roman Nose Resort Park is one of the original seven Oklahoma State Parks, constructed by the CCC and opened to the public in 1937, J.B. Cronkhite was the first man to design and build a recreational facility in the big canyon. He had the name "Big Springs Resort" picked out for his park. Charles Gould suggested the man Roman Nose in honor of the man who had lived at the site. The name, he contended, would reflect the park's Indian heritage and distinguish it from other public recreational areas.